I did put in the batteries and switch it on while pressing the pairing button, the LED lights up but when i connect to PC nothing happen. I got the the ASF manager and assign Comm port 6 (which i plug into) and click "Read" and i try to change some settings and click "program" then i quit the application then run it again. when i click "Read", it only show the default setting. i've check with multimeter and theres no loose connection between all wires and connection. check using voltmeter and theres around 3v at the red and black wire. btw, hv u build this ICS cable before? I havent build one myself. I dont know enough about electronics to answer what could be wrong. Be sure to use the laters software. Maybe PM dabinn to ask for some things you could test out to find out if a component is broken. Did you try other comm ports in the program ? Use a PC with a serial port to test at first. Avoid the problem of USB to RS232 converter. And make sure the pin assignment of the transistors are correct. Most of them are not the same with my drawing. hi dabinn, how to know the pin assignment of the transistor using digital multimeter? i've search the net but none found ...it seems that only the diode and the transistor need to put in a correct position (pin assignment)right? i have no pc with serial port, only USB...how can i resolve using USB? is it as easy as plug n play or i need to configure something else. Yes, the diode and the transistor need to be put in right direction. 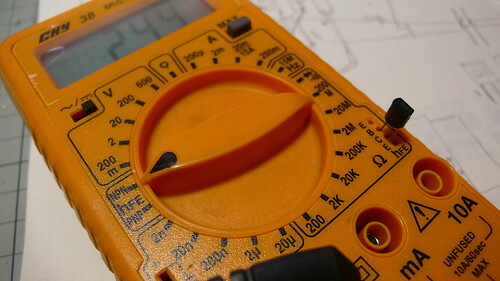 You may use a multimeter like mine, it have a transistor test function. It would be more easy to distinguish it's pins. Acutualy no configuration is needed with the USB converter. All you have to do is installing the driver for it(if needed). But some of them may are not very compatible with all rs232 devices. Since you don't have a serial port, You may try to diagnose the ciucuit at first, eseciailly the transistors. Last edited by dabinn; 2009.04.22 at 01:08 AM. thanks so much for ur reply, when i put the transistor into the digital multimeter, the multimeter should "beep" indicating its the right direction? or there will be some readings i need to obeserve. and do u hv the link to download the ASF manager which is in english version? mine will only come out in weird character. im so happy tonight....come in to office at 12 am just to use the old computer which still using serial port, the DIY ICS is working just fine...thanks so much Dabinn and LED! one more, how to use the USB-Serial converter? Do you need software for the usb-serial connector ? I guess you need to try every port untill you find the one that works. it only needs a driver and ive already installed it, tried on all ports but still no luck...dabinn said some USB - Serial converter might not work, is it true? Won't work for voltage regulation, but how the hell else would you connect it to PC? I think kyosho usb dongle simply regulates the voltage and is otherwise the same as this solution. I hope I'm not wrong, because being stuck w/ using series renders this marvel utterly useless. Hey can I just wire 4x 10k Ohm resistors in a series to replace a 39k one? Radioshacks don't even carry those, but I have lots of 10k ones. Yes you can put resistors in serie and add the values to eah other. Ub02... did you download the manual on the same link I gave earlier ? Read the bit about how to check wich com port you should use. If that doesnt help then I suppose its the usb- serial convertor holding you back. Is there going to be a difference between the 39k and using 40k? Im in the same dilemma i don't really feel like using 3 10k's and more misc ones to make 39k.